Aladdin’s Wishes will be extra popular again this month as the casino genie at Springbok Casino is granting everyone ten free spins and giving them bonuses up to R1500. You don't need a magic lamp to be granted free spins and bonus money. Just enter these coupon codes as you deposit. Aladdin’s Wishes is a magical Arabian fairy tale theme game with a Free Spins bonus feature. The story of Aladdin and Princess Jasmine comes alive in this five reel, 20 payline game with a beautiful Princess, a big green Genie and a Magic Carpet spinning on its reels. Three or more Magic Lamp Scatter symbols triggers the bonus feature where players pick from five lamps to reveal prizes including up to 25 free spins or an up to 100x bet multiplier. All wins are doubled during the free games feature. 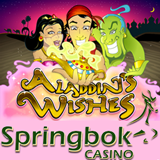 Aladdin’s Wishes has been one of the most popular slots at Springbok Casino, especially since it was added to the new mobile casino last month, so it’s no surprise that it’s also the South African casino’s top paying slot game lately.